The venue is the The Hollywood Roosevelt Hotel. The occasion is the Eliason Merit Award 2015 by the Swedish-American Chamber of Commerce of Los Angeles (SACC-LA). 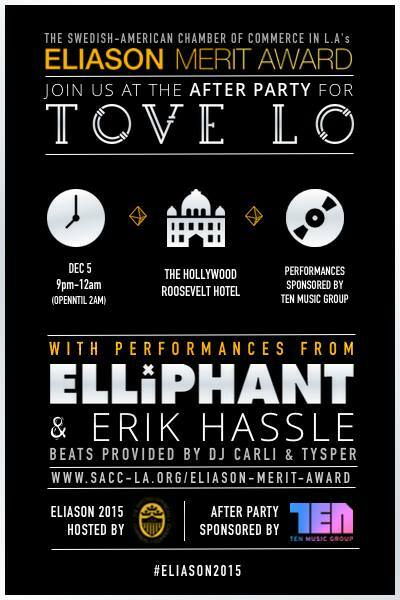 Tickets are ~$94 for the Award Ceremony with Tove Lo. Tickets to see Elliphant are ~$42. Parking at Hollywood and Highland is $15 max and the parking garage on Orange is ?$20?. I'm 90% good after being hit with the flu right now so I'm waiting until daytime to see if I will be going or not.